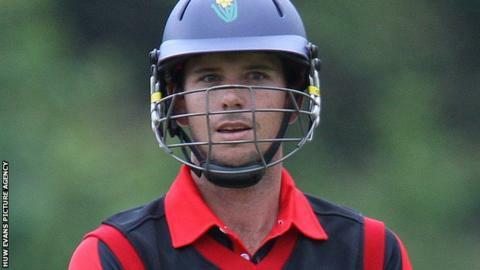 Welsh Dragons skipper Jim Allenby says they must win this week's four Friends Life t20 matches to make an impact in this year's tournament. The Dragons fell to a third successive defeat, this time by bottom side Northamptonshire at the Swalec Stadium on Saturday. Glamorgan face Gloucestershire on Monday, then take on Worcestershire, Somerset and Warwickshire. "We need to win four out of four now," said Allenby. "We're certainly not out of it, but it's going to be tough now and we've just got to win four out of four and I guess there's nothing to lose." Following the game at Bristol the Dragons face Worcestershire at home on Tuesday before Somerset visit on Friday and the final group game at Warwickshire next Sunday. Allenby says the summer's rain-affected play has not allowed for a consistent assessment of how his team are faring. The Dragons have won only once in this year's tournament - a victory by five runs under the Duckworth-Lewis method against Warwickshire on 17 June. But Allenby admits the effort against Northamptonshire in a nine-wicket defeat left much to be desired. "It was a very poor evening… We didn't bat well [or] bowl well," said Allenby. "We fielded okay, but apart from that we were quite poor. "It was a bit deceiving. It looked potentially a wee bit better than it was and we just didn't adjust quick enough. "I would expect our betting order to be able to adjust a bit quicker than what we did. "Having said that, it did look like a very good pitch - a 160-170 [runs] sort of wicket. "It turned out it wasn't and that allowed them to play the way they did to chase the score down… but chasing 110 was always going to be a bit tricky for us." Coach Matthew Mott said: "With all this rain around it's been hard to gauge how we've been going. "It's been a disjointed t20 so far and with only 10 games we've really got to get our act into gear straight away. "We've got to sort it out and guys have got to take ownership with the bat. We've certainly got the artillery there - we've just got to use it a bit more wisely."